Last Saturday after dark, about 60 people gathered at a Seattle’s On the Boards theater to begin a neighborhood walk called “Unsilent Night.” Created in 1992 by New York composer Phil Kline, it is a “luminous soundscape” enacted for 45 minutes on a single night in December. This year, 37 American and Canadian cities joined in. And so we began, moving block by block, a mesmerizing river of sound flowing slowly along the sidewalks of the city. An initial shimmering of bright cascading notes eventually evolved into the low rumble of droning chords, succeeded by percussive xylophone patterns, as if Steve Reich were composing for gamelan. Those metallic notes later gave way to more drones and electronic chords, which became the ground for choral fragments: Gregorian chants, wordless repetitions of ‘ah’ pitched at varied intervals, and melismatic Alleluias. Despite this discernible evolution of musical shifts and changes, the cumulative effect felt unhurried and relaxed. The Queen Anne neighborhood is a lively mix of small shops, restaurants, and theaters, plus a cinema and basketball arena. A diverse assortment of people was already out looking for the heart of Saturday night, so there were many witnesses to our sonic procession. But surprisingly few showed much reaction. Some stared blankly, as if this unexpected phenomenon eluded their emotional register. They simply didn’t know what to make of it. Others looked away, perhaps wishing us into invisibility. Such a thing should not be happening in their world, so they pretended it wasn’t. Still others wore earbuds, disabling any receptivity to a reality beyond their own self-enclosure. Yet some indeed had ears to hear, responding with smiles or looks of wonder. Car windows rolled down to let in the sound. The Latino doorman of a boutique hotel grinned ear to ear as we passed. A homeless woman in a wheelchair gave us a knowing smile, as if we were a welcome sign of sad times ending. Like the best liturgy, it created community out of strangers through a shared action, and forged our collectivity into both sign and instrument of mystery and wonder. It was a perfect rite for Advent, contesting the old order while announcing an “impossible possible” drawing near. For the 45 minutes of the sound sculpture, sidewalks designed for functionality (keep moving to your next purchase, or go home!) became spaces for play. The ugliness of traffic noise was challenged by sweeter sounds. Strangers were invited to smile at one another, forgetting their solitudes for a few precious moments. And the birth of something deeply poetic usurped the accustomed prose of urban life. As Twylene Moyer has written concerning participatory public art, it invites us “to re-evaluate what we mean by quality of life, to reassess what we think we know, and to reconsider how we choose to live with ourselves and each other.”[i] Why shouldn’t we feel fully at home in our public spaces, experiencing them as places of human affection and delight, inclusiveness and solidarity, joy and wonder? Why can’t we? 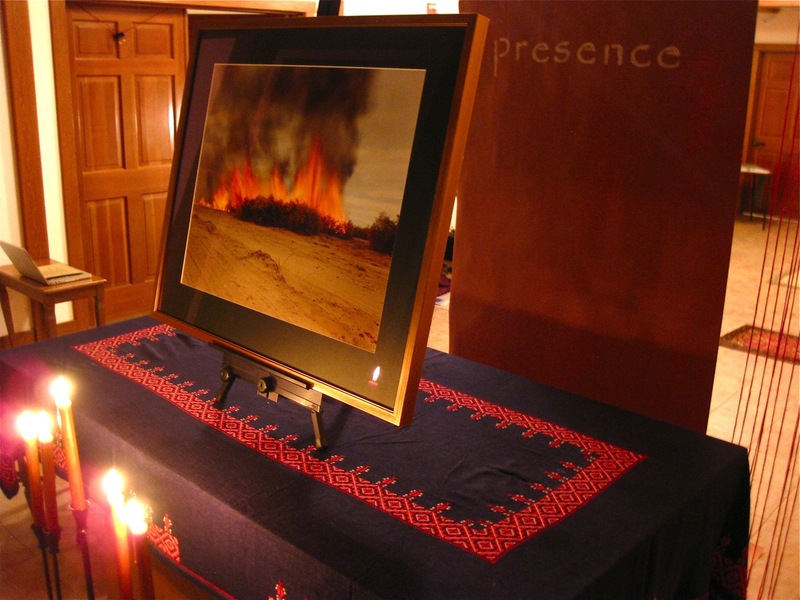 Seeing “the truth hidden and within the ordinary,” piercing the “not seeing of conventional life” with the inbreaking of deeper reality – these comprise the essence of Christianity’s annual Advent project. Not everyone welcomes this kind of seeing, and many reject its very possibility. But for at least some of us who experienced the wonder of Unsilent Night, a richer account of the universe, making room for the transcendent, felt more persuasive than the alternatives. Hark! a thrilling voice is sounding. “Christ is nigh,” it seems to say. Not everyone would put the name of Christ to what we did and the sound we made together, but that doesn’t alter the content of the experience. If God is more of a situation than an object, then the community, relationality, mystery, beauty, wonder, delight, and communion produced by the event seemed apt expressions of divinity taking “place,” or “being here now.” You didn’t have to name it to live it. Toward the end of our walk we were led into a bit of open space set back from the street, where the music was not so compromised by traffic noise. And there our little speakers, one by one, began to ring with a peal of sonorous bell tones, until we were all immersed in such a joyous tintinnabulation that I could imagine myself in heaven. Every face I saw around me glowed with amazement. If the Incarnation were a sound, this would be it, suddenly sanctifying a scrubby vacant lot in Queen Anne. As the bells faded, we processed one more block, back to our starting point, where we stood in what felt like a prayer circle while the final portion of the composition slowly faded into silence. Some closed their eyes, and everyone seemed rapt and attentive, in a state of peace and gratitude. Once the music ended, the spell was quickly broken. We went our separate ways, strangers once more, but perhaps “no longer at ease here, in the old dispensation.”[iii] For a moment we had known something better, and would not forget. [iii] The phrase is from T. S. Eliot’s “Journey of the Magi,” expressing the incompatibility of what the Magi had experienced in Bethlehem with the unredeemed world to which they returned. The greatest thing a human soul ever does in this world is to see something, and tell what it saw in a plain way. Hundreds of people can talk for one who can think, but thousands can think for one who can see. To see clearly is poetry, prophecy, and religion – all in one. 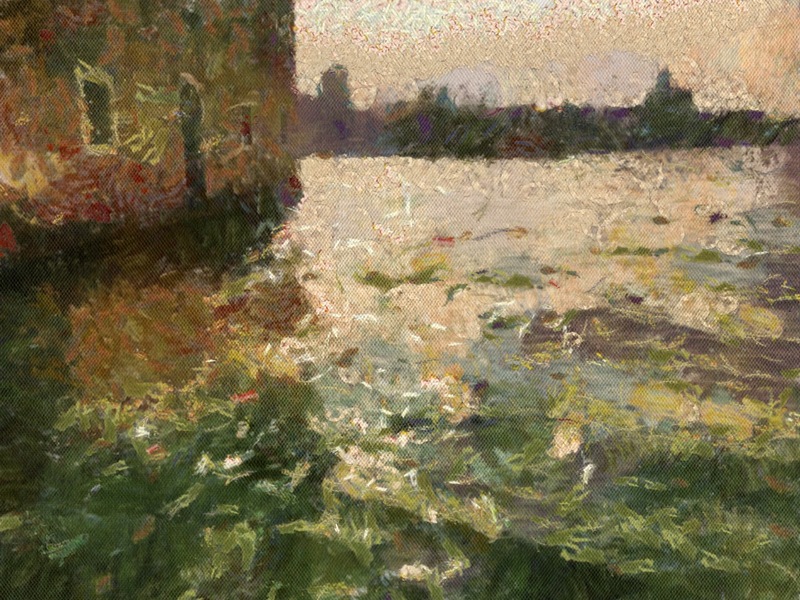 Artists, writers, and dreamers have long made pilgrimage to Venice not just to admire its beautiful treasures, but to be immersed in its spectral fancies, a provocative analog for their own imaginative processes. 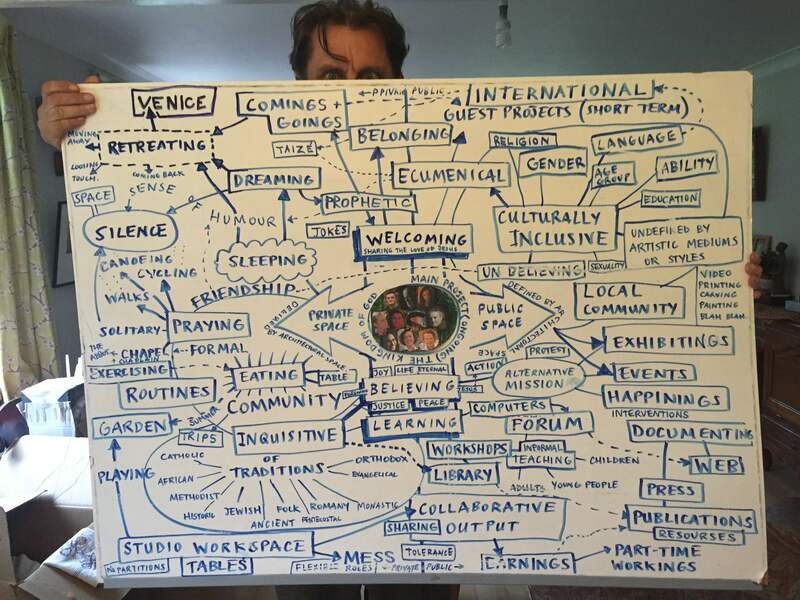 When a small group of Christian creatives gathered there for the Venice Colloquium in late October, we arrived with that same longing for inspiration and discovery. Our collective intention was to “dream the Church that wants to be.” It was born of a shared sense of urgency about the state of imagination in the common life of God’s friends. In my last post, I wrote that “the practice of holy imagination is like a sanctuary lamp in the life of the Church. If not duly attended to, it is in danger of going out.” In a week of group conversations and Venetian wanderings, we tended the flame as best we could. “Church,” said another, “has become the place where you go if you know, rather than the place to find out. It has become the place of the answer instead of the question.” Could we possibly abandon the project of collecting the best answers and devote our attention to curating the best questions? Where would that lead? Would we just get lost in the maze of unknowability? 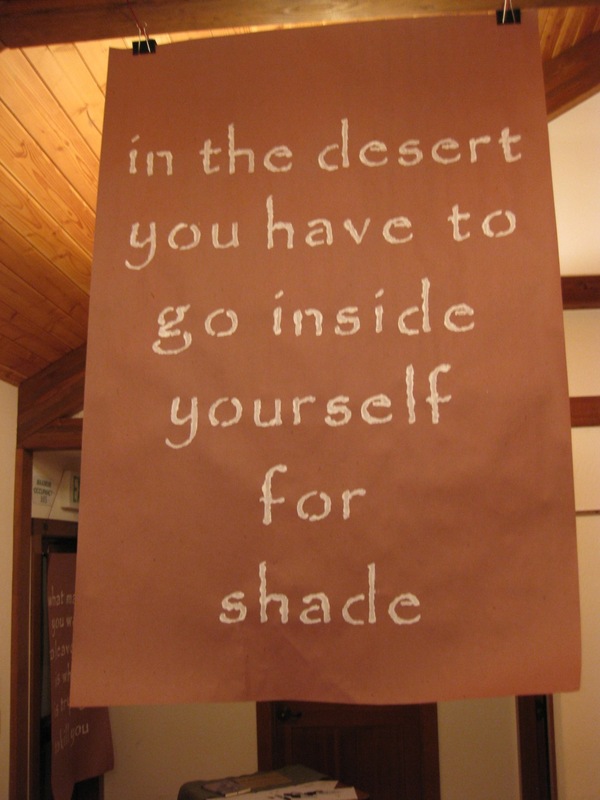 Or as the Psalmist says, is there anywhere we can go where God is not? Where can I escape from your Spirit? When we discussed the drag imposed on creativity by the institutional rage for order, the young leader of an “emergent” Christian community spoke up: “I want a wild church, where things are out of our control.” For Christians concerned about communal stability and institutional sustainability, that might sound like a recipe for chaos. But as our sacred stories remind us, chaos is prelude to creation. And if anyone thinks the Church is not in need of some serious re-creation, they aren’t paying attention. The worship spaces of Venice, with their monumental forms of marble and mosaic, their exuberant decoration, their Bellinis, Titians, and Tintorettos, express a religious confidence that is nearly incomprehensible to our own time. More frequented by tourists than believers, they seem like gorgeous tombs for an expired past. Then what shall we say when the prophet asks: Can these bones live? One Sunday morning I attended mass at San Giorgio Maggiore. There were less than forty people present in its vast interior. But as soon as the liturgy ended, many more people began to stream into the church. 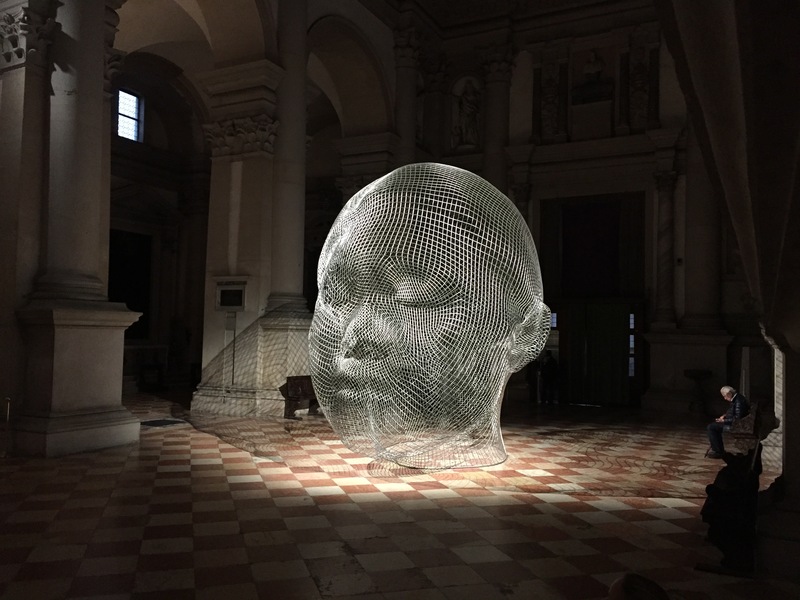 They had come not to worship, but to experience a contemporary art installation, part of the Biennale art exposition taking place throughout the city. A giant head, made of thick wire, faced the altar from the nave. Consisting of far more empty space than substance, it was a ghostly, immaterial presence, in but not of this world. A great golden hand, suspended over the crossing, bestowed upon that serene and mysterious face a perpetual blessing. The contrast between the sparsely attended mass and the popular artwork could be interpreted as a simple duality of irreconcilable opposites: religion vs. art, old vs. new, moribund vs. vibrant, neglected vs. popular. 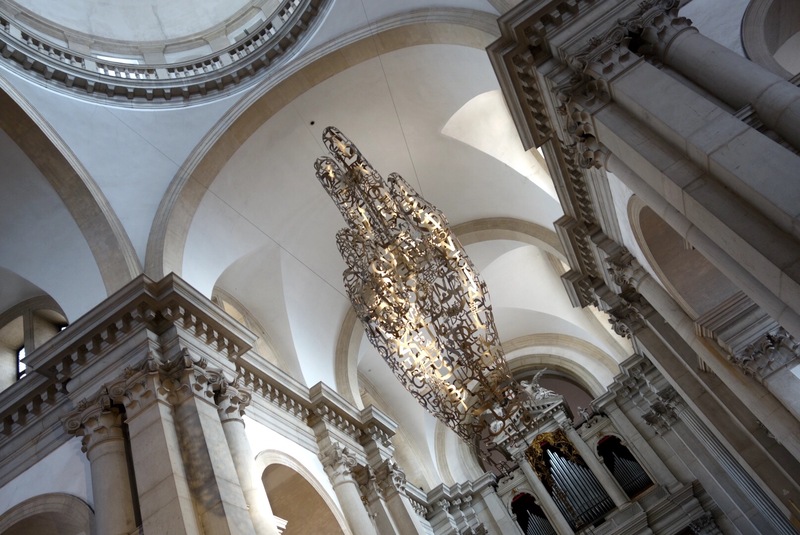 But that would be too facile, ignoring the deep connections between the artwork and the worship space it inhabited. It was not accidental that the head, modeled on a girl of Chinese and Spanish ancestry, faced the altar from the nave, like any common worshipper, or that the blessing hand mimicked the gesture of countless priests who had presided in that place for a thousand years. The work couldn’t be detached from Christian ritual without evacuating much of its meaning. At the same time, there was something universal about a blessing hand and a receptive face. The extreme magnification of head and hand functioned like a cinematic close-up, focusing on the act of blessing in isolation from any specific ritual context or tradition. We didn’t see the vested body of a Catholic priest, or encounter the sociology of a local congregation. We only saw a hand that blesses and a face that receives. For me, the elemental humanity of this universal gesture reinforced rather than replaced the meaning of Christian blessing. The conversation between art and religion, and among artists of many faiths and no faith, can only be tentative and experimental in an age of fragmentation and doubt. It will also be wild and unpredictable. If any of our small group came to Venice thinking we might collectively forge a vision of what the Christian artist is called to be in such a time, in such a Church, we were soon awakened from that fond dream. There will be no manifesto from the Venice Colloquium. We have returned to our homes with no answers, only more questions. And some lasting images. Another Biennale work, Rashad Alakbarov’s The Union of Fire and Water, provided particular inspiration. 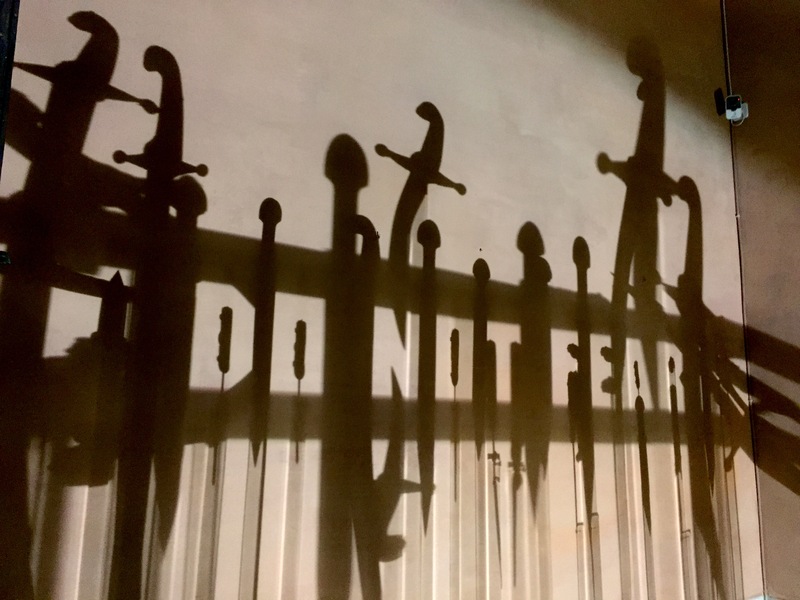 As part of an installation evoking the turbulent political history of Azerbaijan, an array of swords and daggers was arranged in such a way that a message was created from their shadows: Do not fear. The instruments of violence and death had been transformed into an utterance of encouragement and hope. It was reminiscent of the Arma Christi, where the implements of Christ’s suffering become symbols of salvation. Through the play of light and shadow, the handwriting on the wall was there for all to see. For artists out on the road of unknowing, with the voices of caution and order tugging us backward lest we lose our way, it seemed like a word from heaven. Do not fear. 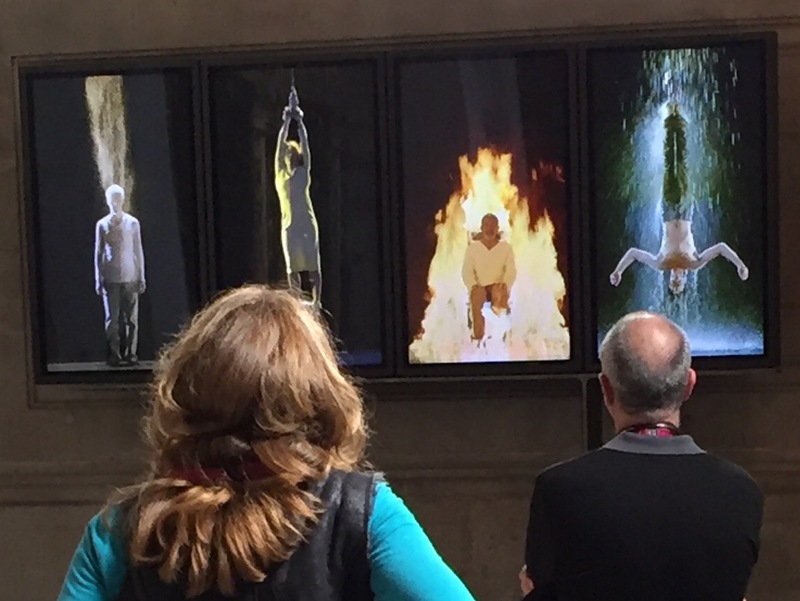 Martyrs (Earth, Air, Fire, Water) was installed at St. Paul’s in 2014, and this week I had my first chance to see it. It is 7.5 minutes long, continuously repeated. Mesmerized and deeply moved, I watched it ten times, and each viewing provoked some new thought or feeling. The figures begin in stasis, undergo an ordeal involving time and motion, and finally come to rest in a perfect stillness: not the anti-life of death or nonbeing, but something implicitly wondrous. All the figures are facing in our direction. In the first panel, a kneeling man, head bowed to the floor, is almost completely buried beneath a triangular pile of dirt. We only see the top of his head, clutched by his two tense hands. The dirt begins to fly upward in a column, disappearing into whatever is above the frame. He rises to his feet, ever so slowly, as if it is a great struggle against gravity, or stasis. By the time he is upright, the last of the dirt has vanished into the “above,” and he is staring out at us impassively. In the second panel, a woman in a white shift is suspended by a rope tied to her wrists. Her feet are anchored two feet above the ground by another rope securing her ankles. She is blown by a great wind coming from the left, buffeted back and forth within the constraint of her tethers, at the mercy of a relentless exterior force. After a while, the wind subsides, her suspended body grows still, and she gazes out with an unexpected measure of serenity. A black man sits in a chair in the next panel, his head tilted to the side and downcast. Then bits of flame begin to drop from above, continuing to burn where they land. More and more flames fall, some leaving trails like shooting stars, until the whole floor, and the chair, are on fire. By this time the man has raised his head to look out at us, but he appears calm and still even as the flames envelop him. He remains in that position as the flames finally relent and die out. In the last panel, a man is curled up in a fetal position with eyes closed. A rope tied to his angles is suspended from somewhere above the frame. The slack starts to be taken up, pulling his legs upward, and then his entire body, until he is completely upside down like the Hanged Man in the Tarot, or one of those skinned animals dangling in a Dutch genre painting as a secularized image of Christ’s Passion. When a stream of water begins to fall from above, his arms slowly stir, moving into a prayer position, bent 90 degrees at the elbow, then gradually sweeping backward, like a swimmer’s breaststroke, until they are near his side. Meanwhile, his inverted body begins to be pulled upward by the rope, toward the source of the falling water. All of the figures have been handed over to forces or situations beyond their control. One buried, one bound and buffeted, one burned, and one left for dead. Yet none of them rages or resists. They accept their condition with a calm grounded in something greater than their own survival. The fourth figure, the “Hanged Man,” provides the dissonant harmony within this suite of images. He is the one who appeared already dead, his suffering behind him. His eyes, either closed or obscured by the water streaming down his face, are never quite visible. Although his arms eventually make hopeful gestures of prayer or embrace, the rest of his body stays limp, totally given over to the power at the other end of the rope, which pulls him up and out of the frame. The water continues to fall when he is gone. Unlike the prayerful final images of the other panels, the fourth is fraught with absence. The other martyrs only gaze at the transcendent. The fourth has already ascended there, and we are left with only the water as a reminder of the one we can no longer see. But these evocative images can’t be reduced to a single meaning. The more I watched, the more meanings and associations were generated. The first figure suggested Adam formed from the mud, or Christ rising from his grave, shedding mortality clump by clump. It also seemed a kind of birth. The strongly sidelit second figure, whose white shift and platinum hair glowed against the black background like a Zurburan crucifixion, mirrored both Jesus and Joan of Arc. Like gold in the furnace God tried them, and like a sacrificial burnt offering God accepted them. [v] The fire in the third panel not only recalled the light of burning martyrs, but the positive biblical tropes of the refiner’s fire and tongues of flame. The fetal position of the fourth martyr evoked both the womb and the grave. The falling water made me think of both baptism and waterboarding. Once he was gone, however, it spoke to me of both memory and promise: what had happened to him, and what might happen to us. Just what – or who – is at the other end of that rope anyway? [i] “Technology and Revelation” is the title of a lecture I heard Viola give at the University of California at Berkeley, September 28, 2009. 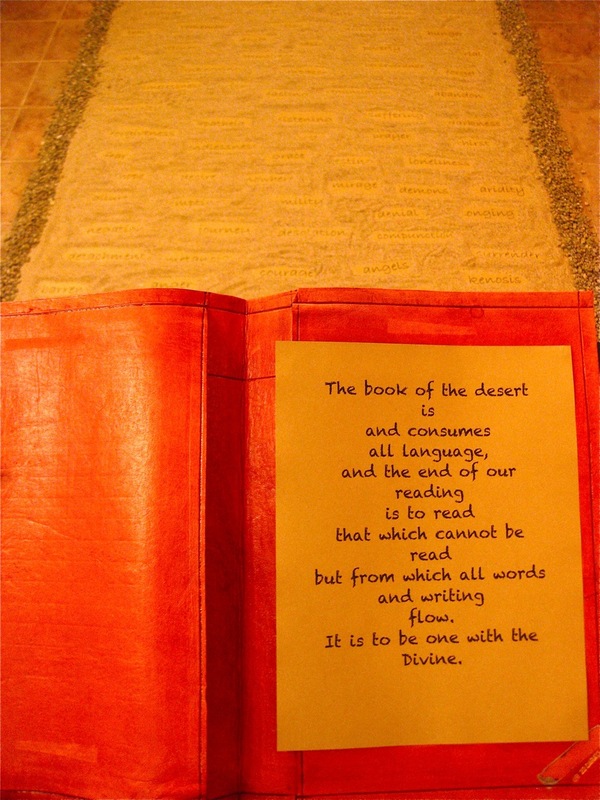 [iii] This was Simone Weil’s definition of prayer. 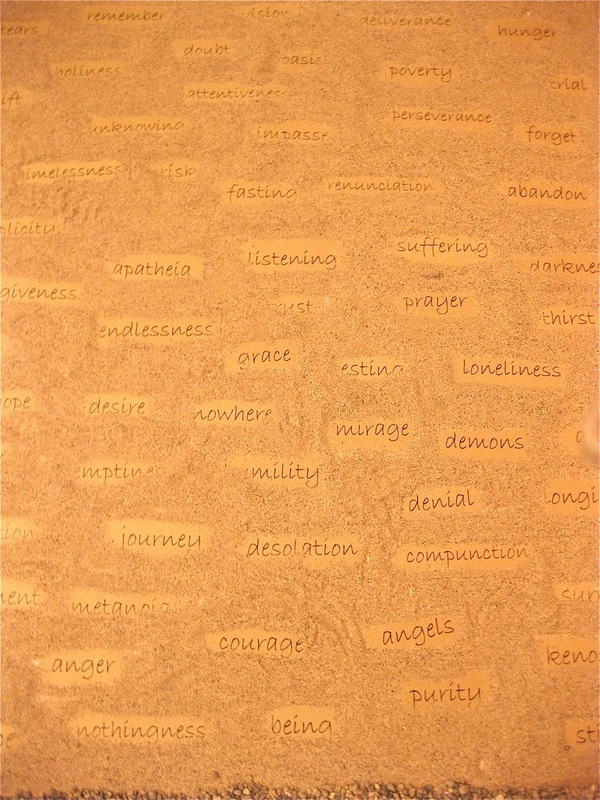 [iv] From the installation’s explanatory text. Patmos is one of the smaller Dodecanese Islands, a grueling 8-hour middle-of-the-night ferry ride east of Athens. It has gorgeous bays and quiet beaches, superb mountain views, charming villages and, at least not in summer’s high season, a tranquil predominance of locals over tourists. The outsiders I have met are themselves “regulars,” returning again and again because they love it. Yesterday a man from the Netherlands told me this was his 23rd straight year of month-long visits. 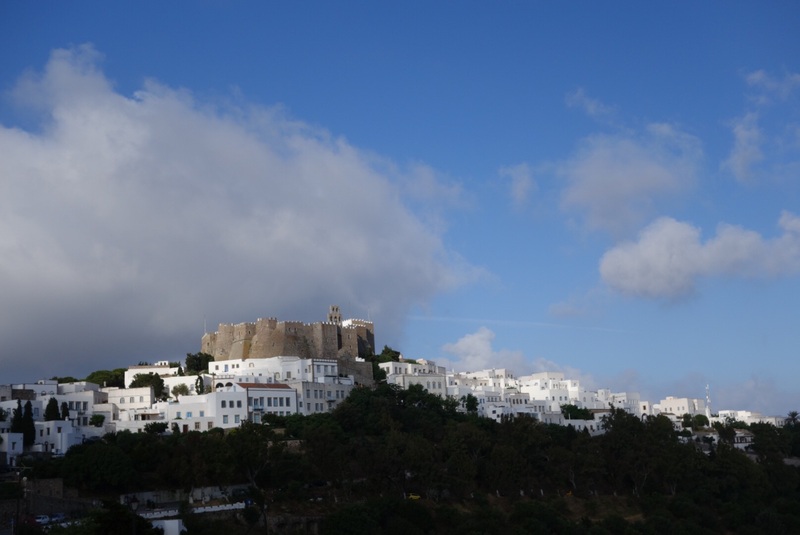 Patmos is also a place of pilgrimage, where St. John the Theologian (or “the Divine,” as we say in the western church), fell into a swoon and saw things which have intrigued, puzzled, disturbed and inspired readers ever since. The Book of Revelation has, regretfully, provided horrific weapons of mass destruction for hellfire preachers, but it is also the source for many sublime hymns and prayers in my own Anglican tradition. So the Christian can’t come to Patmos and simply lie on the beach or relax in the taverna. The Holy Monastery of St. John the Theologian beckons from the high ridge above the port. Its dark-hued fortress of lion-colored stone makes somber contrast with the whitewashed village around it, as if to say that the ascent of this hill is serious business. The monastery rises above the village of Chora. If you rise early, you can experience the awesome richness of the monastery’s Katholikon (main church) in solitude. The brilliant wall paintings, recently cleaned, immerse you in holy images. Along with the intricately carved iconostasis, hanging oil lamps, and numerous icons, they effect a ceaseless engagement of the eye. 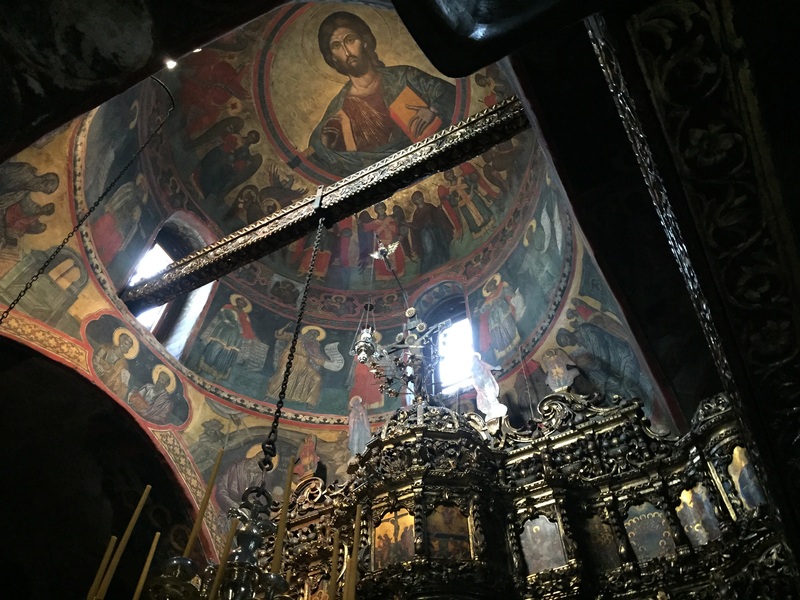 Some might find this distracting for prayer, but for me the sense that there is always more than I can take in – the visual inexhaustibility of Orthodox interiors – can lead to a kind of surrender, overwhelming and transcending the subjectivity of my own thoughts and perceptions. Here is Mystery. Give over to it. Lose yourself in it. The monastery museum holds an eclectic assortment of treasures, including a 6th century gospel book, a 1499 Venetian collection of Aristophanes’ comedies, a 6th century BC bust of Dionysus (god of wine and ecstasy), the largest Orthodox collection of 5th-6th century Coptic textiles, preserved by the dryness of Egyptian tombs, and a police blotter in Arabic from the late 15th century, when Byzantine territories had fallen under Muslim control (“The Cadi [Judge] of the Palace is ordered to find three Patmians who were kidnapped by pirates.”). Below the monastery, halfway up the hill from the sea, is the Cave of the Apocalypse. Here, according to tradition, John lay on the stone floor for several days while the vision unfolded. The cave is not large, but the insertion of a wooden iconostasis into its contours, along with icons and hanging lamps, has made it a compelling place for worship, prayer and veneration. John’s private ecstasy has been reimagined through specific features of the cave. Here is the cleft from which the Voice spoke. Here is the corner when he laid his head to rest between revelations. Here are the fissures where the Trinitarian God divided the rock into three parts with an earthquake. Literal belief in the details of the cave’s legends is not required to make the site holy. It is holy because centuries of believers have given a particular kind of attention here to a Reality which yearns to make itself known in the innermost heart, for which a sheltering, enclosing cave is a tangible, sensory analogy. Another mystical theologian, St. Bonaventure, said, “When you pray, gather up your whole self, enter with your Beloved into the chamber of your heart, and there remain alone with your Beloved, forgetting all exterior concerns.” The Cave, for the attentive, can mirror the chamber of the heart. I entered it three times during my week here. The first time was the Sunday liturgy, full of incense and chanting voices. It was beautiful, but I had no revelations, or even deep feelings. God was present, but I was a bit absent. 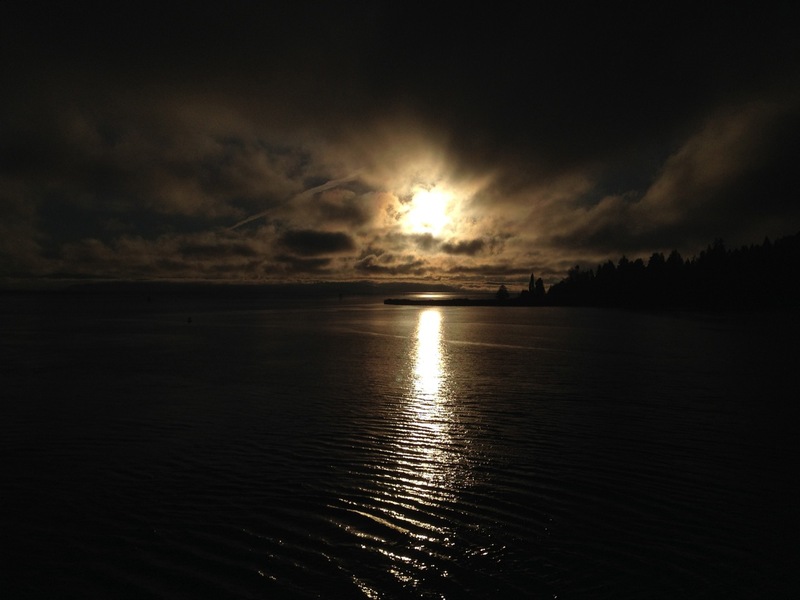 I was tired from a long, sleepless ferry ride. And I knew that whatever the Cave offered was not a tourist experience you can just walk in and collect. So I went back a few days later. The voices I heard then were those of tour guides. Most just reeled off the legends uncritically as if they were prosaic facts. Here this and that happened, blah blah blah, now let’s go back to the bus. But one guide, a Greek woman speaking both in English and German, really got into it. “People think that the Book of Revelation is about judgment and punishment. That is there, of course, but by the time you get to Chapter 21, you find what it is really about: a new world, a new heaven, a new earth, where we will be with God, and God with us. “John’s message is trying to wake us up, to make us see that we are all one because God is with us and in us. Our original condition of oneness will be restored in the end. We lost that unity in the beginning because we had free will, and we chose to have our own experience, and forgot our connection with one another. This morning, my last on Patmos, I returned to the Cave for a third time. Two cantors and a priest were chanting the Divine Liturgy. I was the only other person present. This time, the spirit of prayer came easily, like a morning breeze. I received no visions, heard no voices except the beautiful earthly ones I stood among. But it was more than enough. When the priest handed out the holy bread at the end, I was aware of my outsider status as non-Orthodox. But the priest, who had the face of a Baroque Apostle, turned to me with a slight nod. And so I ate the bread of heaven, and departed well satisfied.